Author(s): Jie Zhu, Qiaoming Zhi, Binhua P. Zhou, Min Tao, Jingyi Liu, National Cancer Institute (NCI), Frederick, MD 21702, USA. Wei Li. Department of Oncology, the First Affiliated Hospital of Soochow University, Suzhou 215006, China. During tumor progression, several types of inflammatory cells are recruited into the tumor site, where they participate in tumor-associated inflammation, such as fibroblasts, granulocytes, lymphocytes and macrophages. Macrophages infiltrating into the tumor microenvironment are termed tumorassociated macrophages (TAMs). In response to multiple stimuli, macrophages undergo recruitment and polarization, and play an important role in further tumor development. In this article, we present a review of the mechanism of macrophage’ recruitment, and the role that TAMs play in promoting immunosuppression, tumor progress and metastasis, as well as chemoresistance and future therapeutic strategies. Keywords: Tumor associated macrophages, tumor microenvironment, pancreatic cancer, breast cancer, lung cancer, lymphoma. Affiliation:National Cancer Institute (NCI), Frederick, MD 21702, USA., Department of Oncology, the First Affiliated Hospital of Soochow University, Suzhou 215006, China. Keywords:Tumor associated macrophages, tumor microenvironment, pancreatic cancer, breast cancer, lung cancer, lymphoma. Abstract:During tumor progression, several types of inflammatory cells are recruited into the tumor site, where they participate in tumor-associated inflammation, such as fibroblasts, granulocytes, lymphocytes and macrophages. Macrophages infiltrating into the tumor microenvironment are termed tumorassociated macrophages (TAMs). In response to multiple stimuli, macrophages undergo recruitment and polarization, and play an important role in further tumor development. 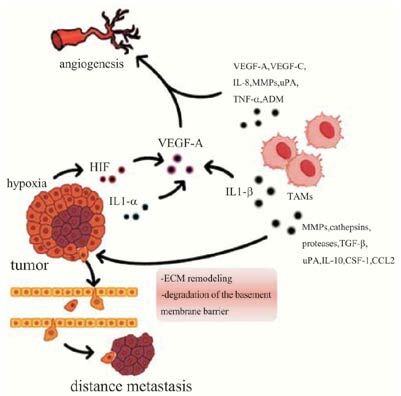 In this article, we present a review of the mechanism of macrophage’ recruitment, and the role that TAMs play in promoting immunosuppression, tumor progress and metastasis, as well as chemoresistance and future therapeutic strategies.